Put on the NEOCP with temporary designation NK0154 in Feb 2003 this 'NEO' turned out to be an interesting Artificial Satellite called IMP-8 (Interplanetary Monitoring Platform) in a 12 day orbit around Earth, launched in 1973. A very interesting account of the follow-up recovery by Reiner Stoss can be read here and more about the satellite itself can be found from the IMP-8 NASA web site. For NEO astrometrists IMP-8 serves a good target to practice very fast moving object (VFMO) work, it can generally be imaged for 1-2 days in each 12 day orbit, travelling at 70 - 90 arcsec per minute at about mag. +18 to +19. Bill Gray has provided astrometric results for IMP-8 on his ProjectPluto site and current ephemerides can be generated from the MPC's Distant Artificial Satellites Observation Page. A review of the history of IMP-8's orbital status from 1973 right up to 2003 was available here by Heather Franz, a member of the IMP-8 team (though by Jan 2004 this had been removed). 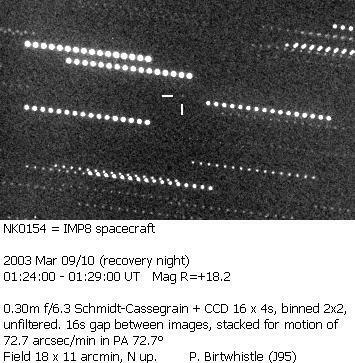 After the 're-discovery' of IMP-8 on 24 Feb 2003 by the KLENOT team and the follow-up from observatories at Starkenburg, Great Shefford, Powell and Observatorio Astronomico de Mallorca IMP-8 was tracked until 16 June 2003. During the summer and autumn months the orbit of IMP-8 is very unfavourable for observers in the northern hemisphere and IMP-8 was not re-observed until 17 Nov 2003 when it was picked up again at Great Shefford. With four months of astrometric observations available to help predict the satellite's position, Bill Gray determined that the ephemeris was only 30" arc off by the time it was imaged on 17 Nov 2003. In a fairly crowded starfield and moving at 66"/minute the satellite was revealed by stacking images in a slightly different way to that done for more 'normal' targets. A series of 45 short (6 second) exposures was taken, with 20 seconds between the start of each image. Normally these would be stacked in consecutive groups (e.g. with 45 exposures stacking images 1-15 as one image, then stacking images 16-30 as the next and 31-45 as the next). However, with a very fast moving object, trying to find a single faint dot on three frames in widely different places on the images is quite difficult. So instead the images were stacked in interlaced sets (e.g. images 1,4,7,10 etc were stacked as one image, images 2,5,8,11 etc as the next and 3,6,9,12 etc as the third image). The advantage is that this places the target object in a similar place on all three images (where the target actually was at the times of images 1, 2 and 3). See the interlaced stacking page for more details. Below is the full field of view from 17 Nov 2003 showing the rich starfield and the track of IMP-8. A close-up animation of the stacked images then reveals IMP-8 clearly by its motion. As with the original single frames there is an interval of just 20 seconds between the start of each stack, though each stack actually has a total exposure of 36 seconds, (each being a stack of 6 images). Only the images in the first half of the run of 45 were used, as the target ran close to some field stars later as can be seen on the indicated track below.